"In the depths of the Heart"
It's possible that over the last few days many of you have begun to feel a little strange, as if the depths of your being were beginning to move about, announcing the emergence of something. But just like a small sprout, it must make its way through the density of the earth to find the light that will give it life. 2015, a year that heralds great conflicts under the astrological influence of Mars and Aries, with the Goat as its animal sign, welcomes us with an important Partial Solar Eclipse on the day before the Fall/Spring Equinox, which from early in the morning, will completely shadow the light of the European day, leaving behind an imprint in our year that should not be overlooked. From the west of the Iberian Peninsula, heading east along the Eurasian Steppe in Russia and passing through the Sahara, Middle East, central Europe and Scandinavia, over the course of the morning, the shadow of the Moon will plunge the European Sky into darkness. Its darkest points will be centred on two groups of islands that few people know, but that mean everything to the world: the Faroe and Svalbard Islands. Let us remember that the Heart of the world is in Europe, that is; it is the European continent. The shadow the Moon will cast over the heart is the equivalent of saying that Mother Sky will plunge the Earth into the depths of her deepest feelings, into the depths of her heart. We are a reflection of the world, and so our hearts will also be submerged in the depths of our oldest feelings, which will bring some of us into an unexpected state of peace with our past, present, and future, and will bring others into a state of nostalgia or a sense of helplessness, loss of purpose and meaning. The heart is the union of our entire body, the motor that joins, harmonizes, pulsates, and connects...Our connections with people, our purpose, and the harmony in our work and our relationships will be affected in this moment of static internal reflection, which the entire world will be forced into. For Europe, this Union will thus present a great challenge. The Mother Moon, the mother of us all, “threatens” to make us relive the most forgotten histories in the European heart: the age of suffering that today still lingers in our gut and which stained the world with blood: the Inquisition will be revealed by mother Isis. In this way, the Union will be threatened this year by the damage inflicted on mother Isis in the history of Europe, on the mother that is, the feminine she represents, and the chest that feeds her: Paris. In a reflective act of history, ISIS, or the Islamic State, will announce the closing of a cycle that needs to be healed in Paris. The true mother Isis, the Moon, will in this way cover both Europe and the Middle East, uniting them in the shadow of reflection: Are we going to repeat history time and time again? Is the present threat of ISIS in Europe a reflection of the fall of the Middle East at the hands of the Inquisition? History is the life of society, which over centuries and millennia experiences the same processes that a human goes through in a few decades, only that its processes are so long that we see them as circumstances that are separate from present injustices. 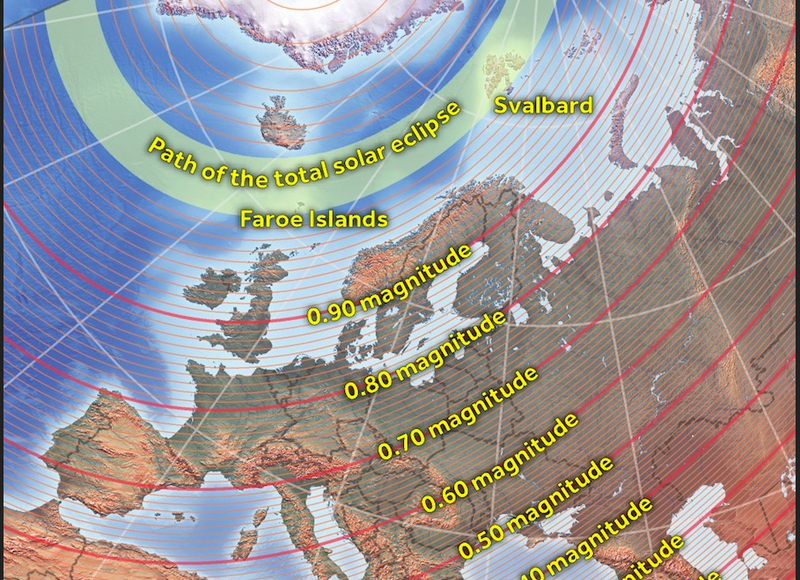 The Eclipse will put the world to test, as the darkest moments will take place around 10:10 am European time, on Svalbard Island, which represents the Pituitary Gland of the Planet; that is, it is the point on the Earth that connects every chakra, gland, and continent. In this way, the shadow of Svalbard will be projected in each of our interiors. Faroe Islands: Highest point of the upper Palate. The Mind and Heart create the most important bridge of the being, which must remain in balance - and both will be cast into darkness. But we mustn't fall into fear or the absurd dualistic belief that darkness is a sign of bad omens, as this is the same darkness that we see when we close our eyes in meditation, and that allows us to connect with the inner world instead of the outer world. As we do in meditation, when we close our eyes and see only darkness, the challenge lies in finding the light that resides within. This light is not individual, but rather forms part of a luminous web that is the reflection of the internal light of our world. In this way, on the day of March 20th, we should direct our attention inward to connective ourselves with our own light and irradiate from within the darkness, illuminating the glands within us that represent the world; recognizing the depths of the Earth that is pressing on the seed that we are, allowing our sprouts to seek the light, as well as realizing that without this darkness, without this pressure, we would never have found the will to transform, or our potential to grow and ascend, while knowing that this earthly darkness is the root that will enable us to grow strong toward the skies. Illuminating our glands from the Sternum to the Brain, that is, from the Middle East to Europe, from Europe to the Faroe Islands, and from there to Iceland and Svalbard, crossing our own internal landscape. Directing inner light toward external chaos, illuminating the exterior from within, which is the world. The activities at the Arsayian Foundation related to the 7 social chakras will begin on the 20th to 23rd of March, which will also be blessed by this Eclipse and will affect all the chakras we will be working with this year. As such, this great internal process will also invade what we are creating together, which is why it is important for everyone who is resonating and sharing what we are doing to also illuminate our purpose together, as we will be put to the test due to the fact that what we are doing will affect the world. We will make our greatest possible effort to sustain the intention of light that we wish to project, supporting our purpose as a network to bring consciousness to the world, which this year will undoubtedly transform. Every process we will experience is a natural process that is part of the integration of personal and collective history. The eclipse will awaken the frequency of reflection on service throughout the world and within each one of us, moving the palate of Faroe to make the pineal gland of Iceland vibrate as well as the Pituitary in Svalbard, coming perfectly to an end in the middle of the north pole: the central axis of our world, and in this way proclaiming an imminent change within the entire Body. Are we willing to cross the shadows to find the light, to go within to listen to the heart? Today and over the course of 2015, we will illuminate our heart, we will illuminate our pituitary gland, and together we will integrate our history which is our skin, extending our new born leaves from the seeds of consciousness of the Earth, which is Humanity. «Animation solar eclipse of March 20, 2015» por Tomruen - Trabajo propio. Disponible bajo la licencia CC BY-SA 3.0 vía Wikimedia Commons.